Finally a Book that Any Business Can Use to Start Taking Advantage of Web Marketing’s Unique Powers. Jon’s book is a primer that demystifies the essentials of small business digital marketing. Digital marketing isn’t hard, but it is complicated. Jon Leland has provided an extraordinarily useful guide that shows the ins and outs of the full breadth of the industry. A great primer, and a must-read for anyone taking the digital marketing plunge for the first time. [This book is] a very refined and focused piece that is brimming with uniquely centered and balanced approaches to both big picture strategy and down-to-earth tactics for Internet marketing. The astounding growth of the Internet has slashed the effectiveness of formerly dependable marketing channels like the Yellow Pages; and at the same time, has enabled more cost-effective and accountable forms of marketing and advertising that simply didn’t exist even ten years ago. Any company that wants to attract and retain customers now needs to be mapping out and implementing its Internet marketing strategy. But there’s a large gap between what businesses think the Internet can do for their marketing, and what the Internet actually can do for their marketing. ComBridges’ president and creative director, Jon Leland has written this Internet marketing book to serve as a guide to this new and rapidly changing New Marketing landscape. 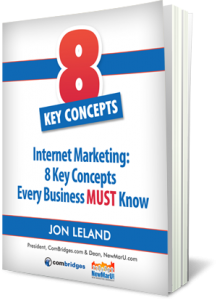 This 90-page book includes the basics of Internet marketing, giving you points of reference and drawing on Jon Leland’s 30 years of experience marketing businesses and non-profit organizations with all kinds of innovative media. As a result, this ebook will help you start plotting your business’s own Internet marketing strategy… and, its success. Note: This is not a comprehensive how-to guide, but rather it is a quick-start primer. It is a powerful orientation that will help marketing managers and business owners to understand the key ingredients of a successful Internet marketing campaign. This book is an overview that can help anyone understand the fundamental components of Internet marketing success. Also, this book is not a “get rich quick scheme” and we are not making extravagant promises. However, we do promise that this book is packed with solid, useful and actionable information. Order Now from Amazon or get the PDF via the button below. Key Concept # 3: Conversions & Customer Engagement: What Happens Next?